UCL undergraduates were among 54 students presenting their original research to MPs in a national exhibition showcasing the best of undergraduate research from 27 UK universities. UCL students from two departments were among 54 students presenting their original research to MPs in a national exhibition, Posters in Parliament, showcasing the best of undergraduate research from 27 UK universities. Hosted by the University of Sheffield, the exhibition, Posters in Parliament, showcased the work of 54 students from 27 universities. Their posters explored an impressive range of unique research topics, including "Is YouTube a gateway to upward social mobility? "; "The lived experience of adjustment to prostate cancer following diagnosis"; and, "To what extent to Punk rebel against gender norms?" Andy McDonald (Middlesborough), John Redwood (Wokingham) and Matt Rodda (Reading East) were among the MPs who attended the event on Tuesday 20 February 2018. The annual exhibition, in its eight year is part of the British Conference of Undergraduate Research. Prizes were awarded to the best research posters. First prize was awarded to James Black from the University of Warwick for his poster entitled "Modelling Panspermia in the Trappist System". UCL students Zane Mitrevica (third year student from UCL School of Life and Medical Sciences) and Enya Gomes Clynch and Douglas Head (second year students UCL Biochemical Engineering) were delighted to have the opportunity to present their research at Parliament after winning UCL Posters in Cloisters. Zane, presented her research on "How the brain produces behaviour: connectomic analysis of aversive olfactory integration of the fruit fly". Enya and Douglas, presented their research on an analysis of spent coffee grounds as a feasible feedstock to meet bioethanol production demands. “I was impressed by Enya and Douglas’ project at the Posters in Parliament event, looking at coffee waste and bioethanol production - it's promising to see undergraduates focusing their attention on the important issues of sustainable energy and waste management. I found it particularly encouraging to see their efforts to reuse the portion of the waste that current recycling techniques ignore. This is exactly the kind of spirit that is needed if we're to move towards a zero-waste, low-carbon economy." The event was sponsored by Paul Blomfield, MP for Sheffield Central, and Sky Yarlett, Houses of Parliament Senior Student Engagement Officer. The 2018 British Conference of Undergraduate Research meets annually every Spring in a different British university to showcase research by undergraduates at all levels and in all disciplines. The 2018 Conference will be held at the University of Sheffield on 12-13 April. "It is great to have an event such as this hosted at Parliament, its great for MPs to know what’s going and for MP’s to be able to interact with such innovative research." "Posters in Parliament is a unique showcase event of the very best research, it is a perfect opportunity to interact with people and research. I have seen some of the best in science and technology and its great that this is hosted in Parliament and I’m sure my colleagues would agree. It is a lovely afternoon! " 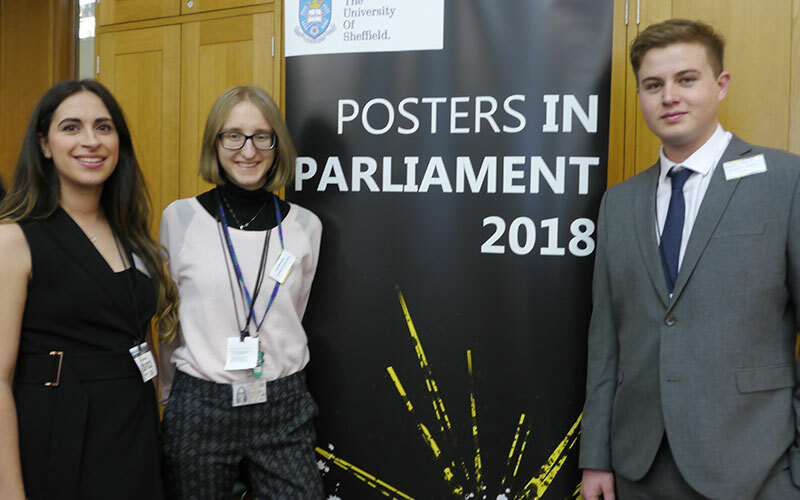 Posters in Parliament: where undergraduates compete on a national stage and present their posters in the Houses of Parliament - next round will be November 2018.